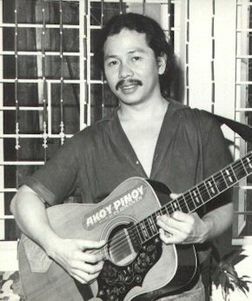 Filipino folk singers seems to be the voice of conscience and change among our people. Recently, I was amazed at how Noel Cabangon (saw it through internet) rallied all the people with his song “Ako’y Isang Mabuting Pilipino” at President Noynoy Aquino’s inauguration. While he was singing, all the people, including the newly elected president, stood up and raised their right hand, as if reciting the “Panatang Makabayan”. During my college days, it was Freddie Aguilar and his rendition of “Bayan Ko“, that inspired people to get on their feet and raised their hands in a fist in unity, clamoring for change. I was one of them who was moved to action and joined People Power in EDSA. Being out of the country and not hearing that song for a while now, I was moved once again when I heard “Bayan Ko” being sung at Cory Aquino’s funeral (again, through the internet). It roused the hybernating patriotism in me. I grew up listening to Pinoy folk singers, among them is Florante. One of his songs have the quintessential question that has struck a chord in my heart. “Dapat ka bang mangibang bayan? Dito ba’y wala kang mapaglagyan?” (Do you need to leave the country? Do you have no place in here?) However during those days, leaving the country is the farthest thing in my mind and I don’t understand what its implications. As long as I had loose change remaining from my “baon” to buy fishballs and to rent Game and Watch, I am more than satisfied. The years passed and I finished my studies. My perspective changed. My concern was not just for my “baon”, but also for the “baon” of my would-be family. And so against Florante’s advocation, I left our country. I struggled for a while with the decision not to return for good. People thought I am crazy for wanting to go back to the Philippines, given the opportunity that I already had to live in another country. In my mind I argued that there were people who left the country and did go home. I was reminded of the two famous people who went back home: one was shot in Bagumbayan, and the other was killed at an airport tarmac. Still, they did come home for the nation’s cause and for a noble mission. The truth eventually sank in. Finally I got it! No, I will not be shot if I went back. It’s just that I was not a hero with a national cause, nor I was hero material in the first place. My mother told me that I will serve my family (and country?) better if I stayed in the US. My mission is on a personal and smaller level. Even after many years, there are still times that I question my decision to stay abroad. Florante’s conscience-probing question of “dapat ka bang mangibang bayan? '” still resonate in my mind. And somehow, it still haunts me. Leaving the country does not by any means, betraying our country. I can be a good Filipino, even if I am living abroad. Even though I can change the country where I live in, I cannot, and will not, change my heritage. “Ako’y isang Pinoy, sa puso’t diwa” (I’m a Filipino, in heart and mind), as sung and declared by Florante, and I proudly and lovingly embrace this fact. My eyes did not suddenly turn blue when I received my green card, my nose is flat (though plastic surgery can change it) and I’m not ashamed of it. “Huwag kang mahihiya, kung ang ilong mo ay pango” (Don’t be ashamed if your nose is flat. ), as sung and charged by another folk singer of my youth, Heber Bartomolome. I hope Florante will understand me, if I did not heed his counsel. I was informed by a reader that Florante himself left the country. I guess he did not heed his own advice. Cordial greetings from the National Historical Commission of the Philippines! I would like to ask your permission to use the image of the singer ‘Florante’ posted in your blog, which we will feature as one of our visuals for the music gallery of the Museum of Philippine Social History in Angeles City, Pampanga. We will gladly attribute the photo to you or your blog. I hope that you would be amenable to our request. If you have any further queries, you may reach me at nhcphsed@gmail.com. Thank you for passing by and asking permission. However I also got that Florante’s image from the net, and I don’t know who was the original source. Sorry if I misled the readers that I own the original photo. From my standpoint you can certainly use the image, though you may need more “researching” to credit the original source. Thank you.